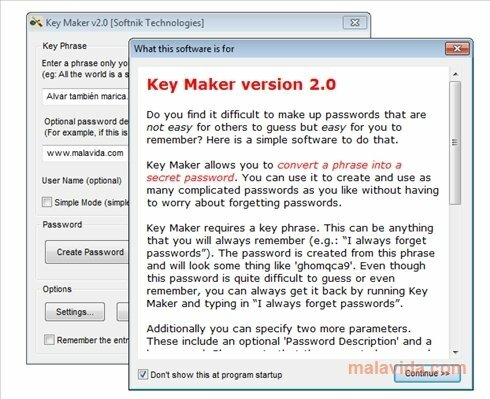 Key Maker is a program with which you can randomly generate passwords to use in any application or web service, but with a different in comparison with other generators, because it allows to link each of the passwords to one of your favorite sayings, something that is ideal so that you never forget them. The program has a very simple interface, that can be controlled with four buttons. It allows to create simple passwords (allowing to assign a single sentence) or on the contrary specific keywords depending on the URL and the user name. It also offers you the possibility to be able to export multiple passwords in a TXT file, so that you can always have them at hand. The tool can stay latent in the system tray and it can activate whenever you require it to remember any password. Discover a program with which you can generate secure passwords from your favorite sayings, after downloading Key Maker to your computer.